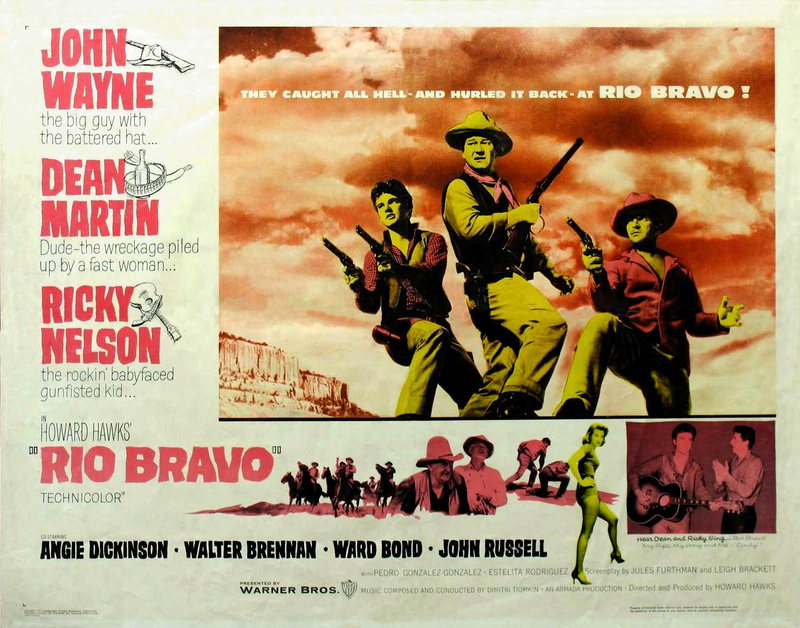 Rio Bravo (1959) | 'TAIN'T THE MEAT… IT'S THE HUMANITY! Hollywood legend has it that director Howard Hawks and star John Wayne were so offended by the premise of Fred Zinnemann’s High Noon (small town sheriff begs the local townsfolk to help him fight off a band of outlaws) that they made Rio Bravo (small town sheriff refuses to ask the local townsfolk to help him fight off a band of outlaws) as their own take on the bravery and stoicism of the western lawman. That all sounds a little too much like Hollywood PR to me though. Hawks, a renowned perfectionist, routinely spent 6-12 months meticulously planning his films and to invest that amount of time, effort and money creating a polemic to a film that was released seven years earlier seems a little far-fetched to me. There’s little doubt that Hawks’ dislike for High Noon may have spurred him into considering a project that was diametrically opposed to Zinnemann’s, but a story about a pragmatic tough guy refusing to back down from a fight is exactly the kind of film that would have appealed to the director of Scarface and Sergeant York. But, whatever the reasons behind it’s conception, Rio Bravo is a good film – it may not be a classic like High Noon but it is a darn-sight more fun. John Wayne plays, well, John Wayne (in the initial draft of the screenplay the character he portrays is called ‘John Wayne’), a small town sheriff defending his jail from a gang of paid-thugs trying to spring a smug Claude Akins. Wayne’s only support is local gunfighter turned town drunk Dean Martin (playing against type), young gun-for-hire Ricky Nelson (doing his best Elvis impression), crotchety old-timer Walter Brennan (playing the same role he played in nearly all his films) and a young Angie Dickinson as love-interest for The Duke. There’s daring-do, gun play, humour and the film ends with the obligatory shoot-out, but with more of a bang. Some critics chided it for it’s slow pace but I’ve never had a problem with the film on that score. It’s entertaining, all the characters get time to breath and everyone involved is clearly having a good time, which always adds to my enjoyment. The movie also has some stellar creative talent behind it. Hawks reunited writers Jules Furthman (Mutiny on the Bounty, To Have and Have Not) and Leigh Brackett (The Long Goodbye and Star Wars: The Empire Strikes Back), who had previously worked together on Hawks’ The Big Sleep. Composer Dimitri Tiomkin was forgiven for his involvement in High Noon and commissioned to write the music and Russell Harlan (The Thing From Another World and Blackboard Jungle) was hired as Cinematographer. The film was an instant hit when released in March 1959 becoming the tenth highest grossing film for that year and Hawks’ second highest earner. It may not have been the most influential of Hollywood westerns (the genre being pretty much played out by the late 50’s) but it has it’s fans. In 1976 Hawks devotee John Carpenter took the basic premise of the film and remade it as Assault on Precinct 13, which is also jolly entertaining.